Professor Doering’s research is focused on the analysis of mathematical models with the aim of extracting reliable, rigorous, and useful predictions. These models range from stochastic, dynamical systems arising in biology, chemistry and physics, to systems of nonlinear partial differential equations such as those that (ostensibly) describe turbulent fluid flows. The techniques employed range from the development of exact solutions to the application of modern mathematical methods including rigorous estimation, careful numerical computations and simulations, and the use of abstract functional and probabilistic analysis --- often a combination of all three approaches. 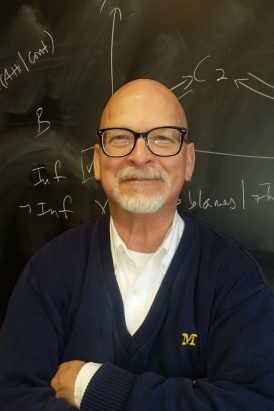 Professor Doering received a Bachelor’s degree in mathematics and physics from Antioch College, a Master’s in physics from the University of Cincinnati, and a Doctorate in mathematical physics from The University of Texas at Austin.